Posted on December 6, 2010 by Jill B. Flash drive maker Super Talent is giving you a virtual boost in the form of a portable app with the Super Talent USB 3.0 Express RAM CACHE flash drive with Ceedo Personal. The Windows friendly Ceedo Personal takes the flash drive from a standard SuperSpeed storage device to a virtual computer that can fit in the palm of your hand. The USB app uses Windows applications that mirror what’s on your own PC by installing and running your programs. That means items like your browsers and bookmarks as well as your photos and documents go where you go. For security and privacy, everything you do within the Ceedo app is in the controlled environment of the flash drive. Once you unplug it, there is no trace left behind of your files or programs. This also means no sign of cookies or temporary files. It’s almost as if you use the host PC solely for its monitor, mouse and keyboard. USB 3.0 connectivity helps to transform how we previously viewed portable apps and their limits in performance. According to Super Talent, a SuperSpeed interface allows the flash drive to behave more like a solid-state drive. The memory stick boasts 32 MB DRAM cache with four channels. Ceedo’s software is compatible with Windows XP, Vista and 7 while the drive is compatible with USB 2.0 performance. 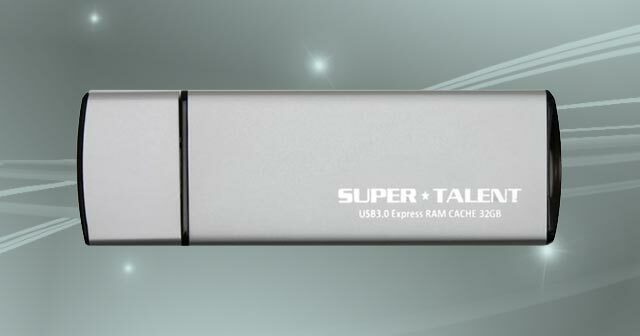 Super Talent’s USB 3.0 Express RAM CACHE with Ceedo is easy to operate. Simply plug in and click on the drive’s Ceedo icon. A taskbar with your programs will pop up at the top of the screen. Once you’re done with using the USB app, closing the taskbar and unplugging the device will save all of the files you worked on. The flash drive bundled with the software retails at $79 for 16GB, $139 for 32GB and $229 for 64GB and can be found online from one of Super Talent’s retailers. What’s interesting about this product is that it’s a quick offline solution that provides an extra boost in security over an option like cloud storage. USB 3.0’s performance helps to make it an ideal platform for this concept and may prompt more portable PC apps on flash drives in the future. In some cases, this may be an affordable alternative to a laptop or smartphone. What’s your take on the Ceedo USB 3.0 app with the Super Talent flash drive? Do you use portable apps? This entry was posted in Articles, Flash Drive, Super Talent Technology, SuperSpeed USB 3.0, USB 3.0, USB Flash Drives and tagged Ceedo app, Ceedo USB 3.0 app, Ceedo Virtual PC, portable apps, Super Talent flash drive, Super Talent USB 3.0 App, USB 3.0 App, USB 3.0 Express RAM CACHE, USB 3.0 Express RAM CACHE flash drive. Bookmark the permalink.